Unrealized Attribution of Incremental Gains to Marketing Efforts: Pinpointing a prospect-to-enrolled conversion to a specific marketing tactic is hard because a conversion may be the result of multiple marketing stimuli spread out over multiple marketing channels over a period of few years. Multi-touch and multi-channel lead attribution models, though available in the form of sophisticated software tools, are not well understood, are difficult to implement, and are simply unaffordable for a majority of colleges. Thus, connecting the dots across a campaign’s multiple components is next to impossible. Inadequate Support for Source Tracking: The next best alternative to attribution software is to deploy simple source tracking, where source-of-lead signals are passed from digital touch points to the CRM system. This is usually unworkable because most higher education CRM vendors don’t support it. Fuzzy Understanding of Student Quality and Lifetime Value: Snapshots of current applicant data don’t accurately measure the impact of students over the entire student life cycle — all the way from being a prospect to becoming an alumn. 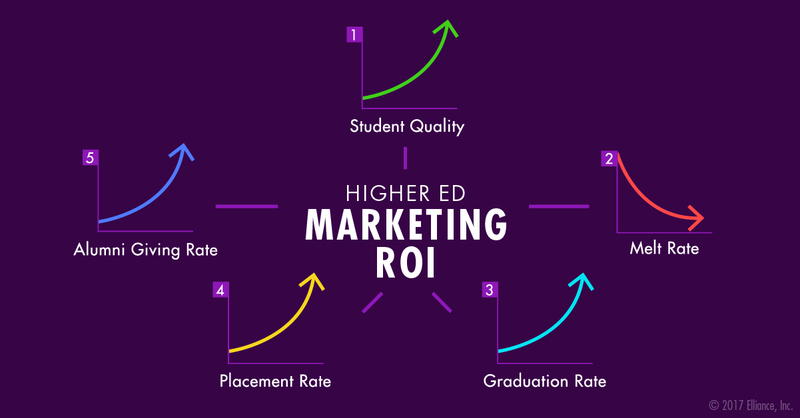 Well-conceptualized brands and well-executed campaigns steadily improve student quality, increase family income, reduce melt rates, grow graduation rates, and enlarge alumni giving rates. The correlation between the characteristics of the incoming class and the long-term value of a student are only understood after a period of several years. However, admissions staff under pressure to “make-the-numbers” frequently aren’t thinking about attracting “right-fit” students. Use of Best-of-Breed Agency Partners: What makes the calculation of marketing ROI even more challenging is the use of multiple agency partners to optimize various aspects of the admissions funnel. Data is often not shared between agencies, which makes it difficult to connect the dots. Our recommendation for colleges and universities is to hire an experienced agency-of-record that can brand the college, implement integrated campaigns to attract right-fit students, make sense of the CRM data you share with them, connect as many dots as is possible, and concurrently focus on the admissions, giving and reputation funnels over a period of several years. We know the perfect place. Let’s talk.